Wingate University has only two official fund drives – for United Way and for the school’s own annual fund campaign. When Wingate’s president, Dr. Rhett Brown, delivered his annual State of the University address, he pointedly told the audience of 360 faculty and staff that if they had the personal capacity to support only one of the two, they should choose United Way. That’s how firmly Dr. Brown believes the school’s third pillar is just as essential as the first two: Faith, Knowledge, and Service. 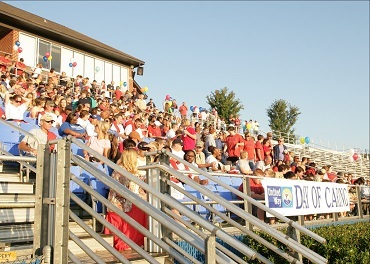 More visibly, Wingate has been the launch site for United Way’s annual Day of Caring in Union County for the last decade, hosting a pep rally for some 1,300 community members before they depart to complete 130 service projects around the community – nearly a third from the University’s own staff and students (a record 393 last fall). Beyond that day, the university makes a point to keep employees and students informed of community needs and engagement opportunities year-round. Such intentional engagement is why the university was listed on the President’s Higher Education Community Service Honor Roll for five consecutive years, and why Wingate recently won United Way’s Spirit of North Carolina award in the higher education category.